A few months ago, I was engaged in jury service. Since doing so, I felt a strong urge to write about the experience, which has felt more than a little surreal, like being part of a television programme for three weeks. The thing which struck me most of all was the nature of the various characters who appeared in court throughout the course of the fortnight. If I had been writing the whole thing as a piece of fiction, I could not have created characters who so closely fit the stereotypes which one might have expected when told their professions or positions. 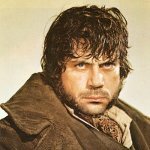 The accused looked and acted remarkably like Bill Sykes. 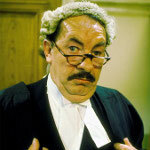 The lead defence barrister appeared to have modelled his entire appearance and performance on Rumpole of the Bailey. Even more amusing, he had a female junior barrister sat behind him who looked like a younger version of himself, minus the moustache and with slightly longer hair (I speculated that by the time she reached senior barrister status, she may well have grown a suitable moustache). Most remarkable of all, a pathologist who gave evidence on the witness stand looked and acted precisely as one might expect of an individual who was far more at home dealing with the dead than with the living. She had a markedly drawn, skeletal, deadly serious face, a strange, nervous speaking style and peered suspiciously round the court room from behind spectacles which probably weighed only a few ounces less than she did. Those were the most notable examples, but everyone who appeared in court seemed to fit remarkably with my pre-conceived notion of how they would be. The judge, the other barristers, doctors, nurses, police detectives. Every one of them seemed to confirm my mental stereotype. It reminded me of a webcast I had listened to a few weeks previously in which the way in which we tend to fulfil given roles had been discussed. In the webcast, the interviewee had discussed how he had met a person at a party and within a few seconds was able to guess that she was a teacher (which he subsequently confirmed by asking her). He went on to speculate that many if not most of us have a tendency to lose the individuality and unique identity that we have when we are younger by conforming to expected behaviour patterns associated with roles that we take on. Instead of being ourselves, we become more or less completely identified with our occupation, or some other role such as a parent, 'one of the lads', a trade unionist, a fat person, a runner, or a victim. How many of us are conforming to roles which we did not choose for ourselves but which we drifted into, or which we took on to please others, such as our families or which are based on something which someone said to us a long long time in the past, such as 'he's the shy one' or 'she's no good with children'. Such identification with one, or a small number of roles, so strongly informs the choices that we make every day that to the outside world we appear to have become the personification of those roles. We forget that every minute of every day, we have the choice to be whoever we want to be, to act however we want to act, to wear whatever we want to wear, to say whatever we want to say and to do whatever we want to do. We forget that we do not have to do what is expected of us. We forget that our choices should not be based on how others want or expect us to be, but on how we want to be, on what makes us feel happy and truly alive. As I think back to the pathologist mentioned above, I am reminded of one hero of the pathology world who managed to buck the trend and very certainly did not conform to any such stereotypes. 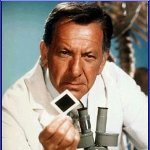 I am talking of course of the legend that is Quincy M.E. Quincy did not confine himself to long hours in the pathology lab followed by the filling in of long and deadly serious reports. This maverick hero's talents could not be so confined and so we would often see him taking on the role of detective, barrister (attorney), counselor or public health champion. He more or less single-handedly solved every case in which he was involved and having done so, still found time to be an unstoppable love machine and to have a bit of cheeky banter and a game of cards with his mates in the pub afterwards. We can all learn a lot from Quincy. Quincy teaches us not to accept limits and to refuse to be labelled by anyone. Quincy shows us how to be the best we can be in every moment of every day by remembering that in each one of those moments, we have a new choice about who we want to be. Quincy M.E. , I salute you.